Creativity, Art, Pottery and Handwork are an essential part of life at Hanford. We believe every child is creative and aim to find what inspires them through a lively stimulating creative environment. 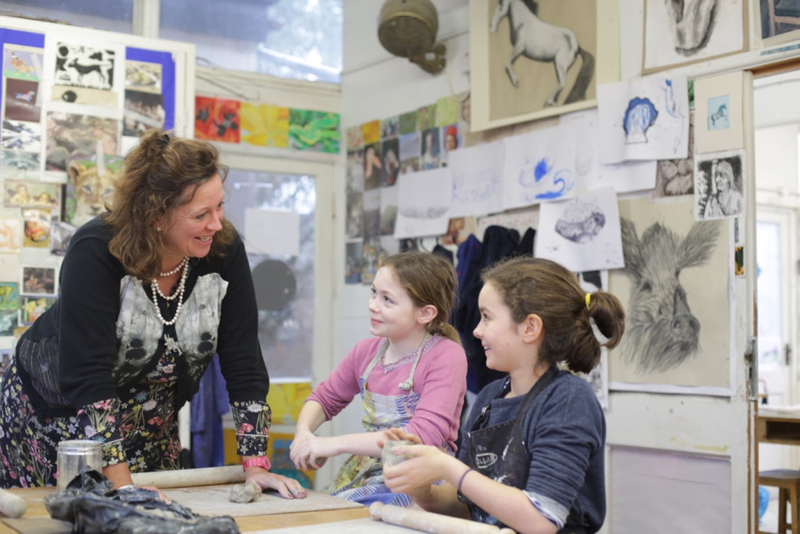 We expose them to a variety of different creative disciplines and media including: pottery, drawing, printmaking, wire, papier maché, plaster and textiles. The grounds and its produce feed their imagination; providing all sorts of stimuli for their creative projects. All year round the school is filled with an abundance of flowers from the garden, crammed into vases and jam jars decorating everywhere from the corridors to the Hall. Perspective and landscape drawing are taught using the magnificent view of the Jacobean house from the drive and surrounding fields; while apples and pears from the orchard are used to teach still life drawing. The flowers from the walled garden offer endless scope for detailed pencil drawings and experimentation with colour. Creativity is not just confined to paper, ink and clay – it also finds an outlet in the Handwork lessons. Here girls learn to appreciate the world of textiles from a simple appliqué for a cushion to a playsuit. While bringing their ideas to life they learn new skills such as machining, pattern cutting and knitting. The quality of the clothes at the UVIth Fashion Show was impressive technically and creatively. Art History, know as ‘Art Appre‘ at Hanford, is a timetabled lesson giving the girls an insight and appreciation of the art world, encouraging them to see the ideas behind the creative process and giving them a language to describe their own work more fluently. The creative work produced by the Hanford girls is consequently of a very high standard with over 10 art scholarships being awarded in the past 3 years.